It's always a little weird each year to post photos of The Hub in bloom and talk about how it's springtime, because the actual blossoming typically happens a month before actual spring. But now that spring has officially arrived (though don't tell the that to today's weather gods in Southern California), I can start citing spring without a massive disclaimer. Around the Hub, spring is the liveliest and most colorful time of the year. And even though that color is predominantly pink, the scene is still dazzling. 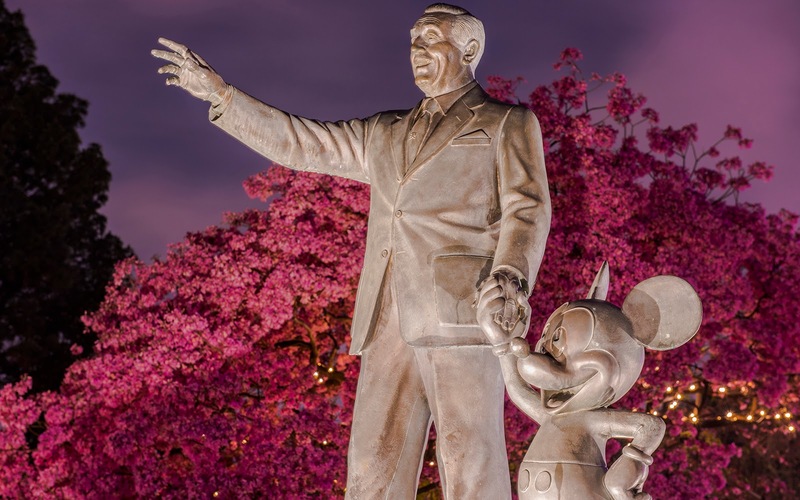 In the center of it all are Walt and Disney, looking on so many years after their dreams came true. The cycle might be regular, but year after year, the coming of spring never gets old! A pinkish glow surrounds Walt and Mickey on this evening cusp of springtime.